This question is based on my experience with bounties I've placed on two separate questions in the past couple weeks, spending a total of 400 rep.
After placing each bounty the questions were moved to a tab on the questions page titled Featured. However the tab is actually a secondary tab which takes more effort for a user to get to, and when viewed on a phone or other small device the Featured tab is not even visible. You can access featured questions on a phone but it is not at all convenient, and the questions are certainly not visible if you don't know where to look. Featured means front and center, most important, not "go click over there if you really want to bother seeing these." Why are questions that are considered featured actually harder to access than the general question list? Wouldn't it be more aligned with the intent of a bounty to occasionally, maybe once or twice a day, bump Featured questions to the top of the general questions list? First, realize that this is fundamentally the wrong place for this discussion–this is a network-wide feature, and RPG will not be getting special behavior. In fact, RPG—along with nearly the entire network—will almost-certainly be stuck with whatever behavior works best for Stack Overflow, because that is, by a massive margin, the most popular, active, and revenue-generating site on the network. Starting the bounty also bumps them to the top of the list. They can drop off from there without activity; at the time of writing, the two featured questions are both below the fold, but they are still on the front page. But for at least a time they are on the top of the list, with special highlighting, and the Featured tab will list only them, and that tab indicates how many there are. We also have a community ad that advertises the Featured tab. So in conclusion, your premise that bounties actually make questions harder to find is simply false (they are at least as easy to find as they were before, since they still appear in the same place), as is the claim that they are not “featured” per the quoted definition (they are bumped, get a special indicator, get a special page dedicated only to them, and that page has its own community ad). Could they be more “featured”? Yes, sure they could. Is that desirable? Seems a bit beyond the scope of this question, but I would argue “no,” personally, at least for the forms of greater “featuring” that come to mind. Clearly, making them “sticky” is far too much; particularly on Stack Overflow you’d fill the entire front page with them (314 Featured questions at the time of writing). Should bounties automatically bump questions regularly, as you suggest? No—any kind of substantive activity on the question or its answers will bump them. If the question is Featured, but still not seeing any activity? Then bumping it more is unlikely to work—the activity just isn’t going to happen. The answer doesn’t exist, or at least, no one has it, or maybe it’s just too much effort even for the bounty. In the end, bounties are, quite intentionally, a limited tool. Ideally, you shouldn’t need them—your question should draw expert interest by being interesting and worthwhile to answer. After all, that is why we are here, because we like answering these kinds of questions. Bounties have their place, but that place is pretty niche. Not the answer you're looking for? 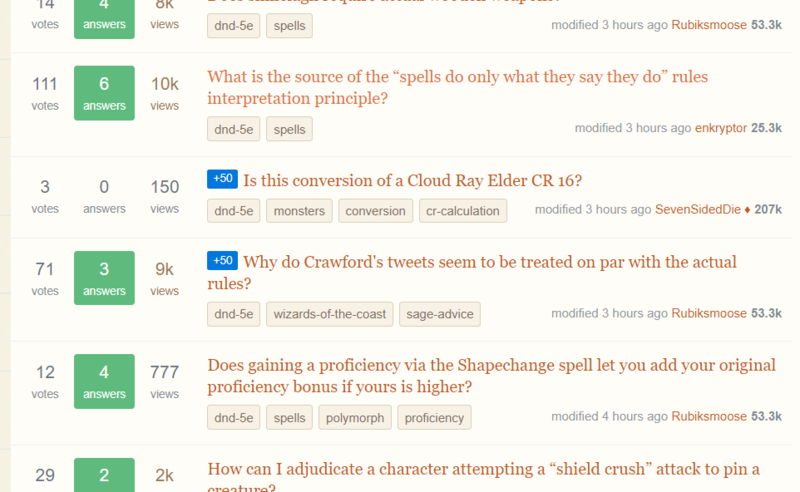 Browse other questions tagged discussion questions reputation bounty site-design . Why are some system recommendation questions being closed while others are not? Why are some RPG not at all present here? We are not lawyers. Why do we allow law topics? Why do some of my questions have a (-2) to reputation? Why does downvoting hurt my reputation (but upvoting does not help it)? How can I reward a good answer without driving more attention to the bad one?